Joss Whedon’s The Avengers could have gone either way. It either could have been a complete disaster, or, a hell of a lot of fun. I’m pleased to report that The Avengers is a resounding success. The film opens with Thor’s brother, Loki, arriving on earth via the Tesseract (a crazy energy cube being researched by S.H.I.E.L.D.). The tesseract is housed in a research facility, and Loki instantly sets out on a path of destruction, battling it out with Nick Fury (Samuel L. Jackson), and destroying the research facility. Fury activates the Avengers Initiative, tasking Natasha Romanoff/Black Widow (Scarlett Johannson) with recruiting Bruce Banner (Mark Ruffalo), and sending Agent Coulson (Clark Gregg) to get Tony Stark. Loki is out to harness the power of the Tesseract, and bring an alien army to earth. He looks to rule earth, with humans as his loyal subjects. Thor also joins the fight to stop his brother. With the exception of Iron Man, I felt like most of the previous Marvel movies (Captain America, Thor, The Incredible Hulk), were fun, but ultimately missing something. If they weren’t part of this series leading up to one big Avengers movie, I’d be pretty disappointed. 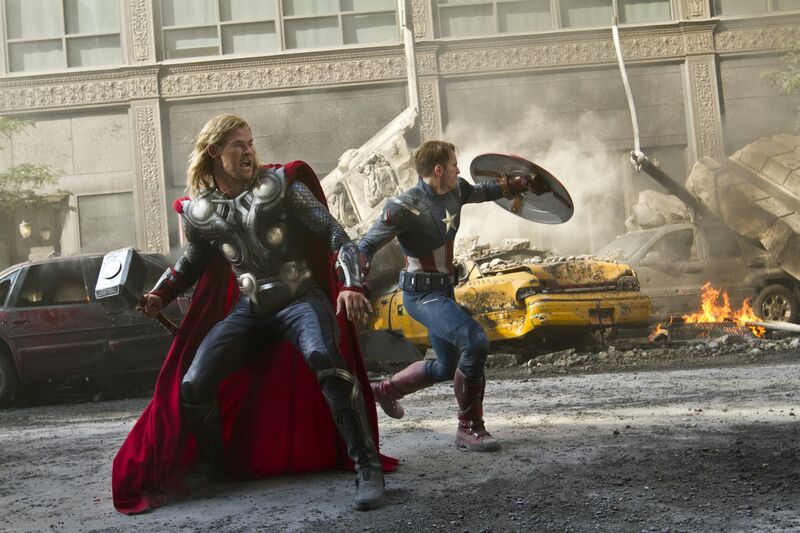 What you have with The Avengers truly is a live-action comic book. Full of action, adventure, and laughs. Robert Downey Jr. is completely comfortable within his iron suit, Chris Evans and Chris Hemsworth still great as Captain America and Thor, and new to the cast, Mark Ruffalo takes up the Hulk better than Ed Norton did. I never bought Ed Norton as Bruce Banner, and I was happy to see it taken over by Mark Ruffalo. He plays Banner in a quiet, humble, likable way, that definitely contrasts well with the Hulk. While the previous films are mostly origin stories, with the big bad guy fights starting and finishing in the last half of the films, this film starts with the conflict – which works much better for the story. The one-liners and argumentative moments between the Avengers was excellent, and the action great. Do you need to have seen every single previous Marvel movie? Not necessarily, you’re given enough back story early in the film so that Avengers won’t be confusing. Seeing as though the film broke weekend box-office records, chances are you’ve already seen the film. But if you haven’t, get out there, there are way too many awesome summer movies, don’t let this excellent popcorn film fall by the wayside.